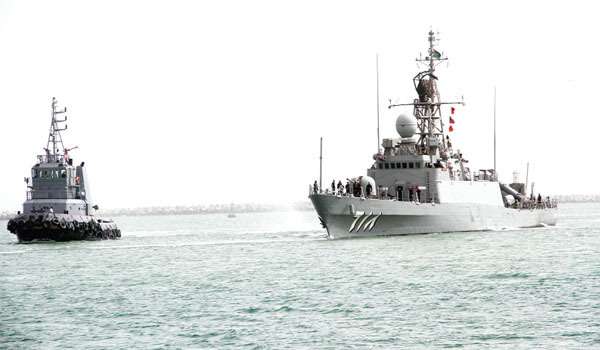 Pakistan Navy (PN) and Royal Saudi Naval Forces (RNSF) will conduct a joint exercise Naseem-Al-Bahr – X, which is scheduled to take place between January 12 to 22 off Makran coast. This was said by Commander Pakistan Fleet Rear Admiral M Zakaullah in a press briefing here on Saturday. He said that it was also a milestone in the history of PN in which the complete exercise would be conducted from Jinnah Naval Base, Ormara. Naseem Al Bahr series of exercises was indeed a concerted effort from Pakistan and Saudi Arabia to promote maritime security awareness for collaborative maritime security in the region. He told the journalists that the aim of the exercise was to foster friendship, develop common understanding and increase interoperability with RSNF in the domains of traditional as well as non-traditional warfare in order to maintain peace and stability for the larger good of the region. In the traditional warfare domain, the objective was to share and refine tactics, techniques and doctrines through jointly undertaking anti-surface, anti-submarine and anti-air operations with RSNF units. In the non-traditional domain, the exercise would mainly focus to improve inter-operability and tactical proficiency in the execution of combined maritime security operations against asymmetric threats like piracy, counter terrorism and defence of port infrastructure to mention a few. Four RSNF ships which included frigate (HMS MAKKAH) embarked with Dauphin helicopter, a guided missile equipped patrol craft (HMS TABUK), Mine Counter Measures Vessel (HMS SHAQRA) and a tanker (HMS BORAIDA) to participate in this exercise. In addition, one platoon of RSNF Marines and one Special Operations Force team along with Explosive Ordnance Disposal elements had also arrived in Pakistan for various exercises. Three PN destroyers/ frigates, missile boats, mine hunters, submarine, PN Long Range Maritime Patrol Aircraft, Helicopters, elements of Pak Marines, Special Services Group (Navy) and PAF fighters were representing Pakistan in this exercise. PN had regularly conducted bilateral and multilateral exercises with regional and extra regional navies to improve its interoperability with international navies. These exercises were a clear manifestation of Pakistan’s commitment towards maintaining peace and stability in the region. Naseem-Al-Bahr was one such bilateral maritime exercise. Pakistan and the Kingdom of Saudi Arabia had not only enjoyed deep-rooted fraternal ties, but had also shared historic maritime traditions. Naseem-Al-Bahar was a biennial exercise, which was evolved as manifestation of the unique Pak-Saudi interpersonal relationship and mutual resolve to enhance bilateral cooperation in facing the common challenges. Participation of RSNF ships in this exercise would further strengthen existing bilateral relations between the two brotherly navies. After arrival of RSNF ships, the exercise would progress through phased activities in harbour and at sea for gradual improvement and coordination in all professional realms. The exercise would culminate with Live Weapons Firing by RSNF and PN units. The activities in harbour include professional seminars on information security, counter piracy, mine counter measures and host of other events which would provide opportunity to share experiences and knowledge. Sea phase of the exercise was planned between January 13 to 20, in which RSNF and PN units would operate together and would exercise all facets of modern warfare. In order to draw pertinent lessons based on exercise interactions, detailed analysis of all phases of exercise would be conducted jointly by the PN and RSNF sea training teams on January 20-21. It would be followed by debrief of the exercise on January 22. The good thing about Naseem-Al-Bahr series exercise was that each series was refined and improved based on lessons learnt from previous editions. We the Al-Qayadat International License No 1847/ Karachi-Pakistan hereby introduce as one of the most Reputed, Professional, Progressive and Fastest Growing Recruitment Agency in Pakistan. Recruitment of the International market having established offices in Karachi-Islamabad, nationwide. We are specialized in human resource and work force services providing Consultancy to foreign companies and organizations. We provide skilled, semi-Skilled, unskilled, workers for as well as general labors to our clientele in Gulf. We can provide the workers in shortest possible time as we have more then 100 experienced applicants for this industry those have working experience of local and international companies into this industry. We would be pleased to join hand with your esteemed organization and would appreciate if you will consider in appointing us as your exclusive recruiting agent for recruiting said work force from Pakistan. We assure you our best service and will furnish you with honest, efficient, reliable candidates for your valued client's scrutinized by our executive officers/ panels. We will be glad to receive your your best and kind considered reply to act upon the same and qualify the official papers/job order and demand letter to complete the procedures. Thanking you and assuring for our best cooperation at all the time. Al Qayadat International Manpower Consultant.